The mural discovered in the German House coming from the period when the building was used as the theatre. The historical storms did not avoid our town, too. Many- from the point of view of the settlement of the significant and important - buildings were destroyed, so we can know them only from the written records, which is almost a wrong in relation to the famous history. We have decided at the beginning of the architectural planning to rebuild those destroyed works we considered the most important and to bring them back to life. 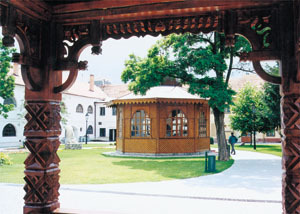 The copy of the Music Pavilion. Originally it was situated in the City Park and it served for the purpose of the Garrison Band, which was conducted by Franz Lehar and Beni Egressy. Reconstructed in year 2000. Tibor Bastrnák, the Deputy Head of the District Office in Nitra, and historian Zoltán Szénássy gave a ceremonial speech at the unveiling. However, after hundred years the goals of the movement have become true. We have decided to visit Gmunden at the beginning of the designing of the Europe Place and to find this work of art, which was known only from the descriptions and photos. It was important for us as we were curious to know the present well`s conditions, and we also wanted to get those historical data which would help us to build the copy of the well. And our hopes became true… Our little team left Komárno early morning on 2nd October 1998. We wanted to be sure that the well is protected till today. We reached that place after five-hour-long journey in the car and we found the Orth-Chateaux with the assistance of the inhabitants. We opened the gate, stepped in and there was the work of art decorating the main square in Komárno. After the first emotion we started to work. There was a paper, a pencil, a tape-measure and we prepared the correct draw of the creation. We took many photos of the well, and of its pieces. We met the director of the museum, he was very helpful when we told him why we came. He told us how the well got to its present location. 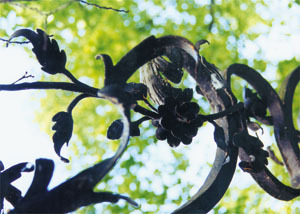 We learned that it was renovated in 1996 and the rusty pieces were changed. These pieces were in the warehouse and after they found out the aim of our journey they gave us them. On the basis of the measuring documentation we have made the copy of the well. Our original intention was that it would decorate the Millennium Fountain in the Europe Place but later we had to admit that its best location is its original location before the Town Hall where it was standing in 1777. 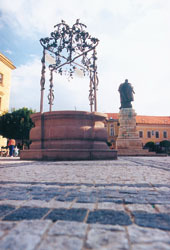 The Well of the town was passed solemnly on 14th July 2000 at the George Klapka Square, thanks to the Palatinus Civic Association, which protects and beautifies the town and thanks to the Euro Investa, a.s. Bratislava (they financed the work, the transport and the setting up of the copy). 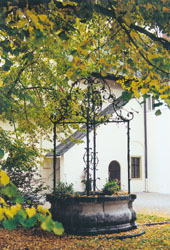 The town agreed with the temporary location of the well till 31st June 2001. Several deputies of the town council and the inhabitants of the town took part at the small ceremony. 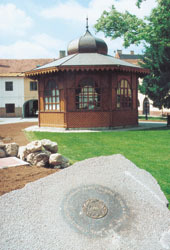 Zoltán Szénássy, the local historian expressed the words of thanks for the reconstruction of the well on behalf of the inhabitants of Komárno. Miklós Fehér, member of the National Council of the Slovak Republic for the Hungarian Coalition and a member of the town council, made a ceremonial speech on this occasion. „We gathered together to celebrate the reborn of the important piece of art from the point of view of the history of the town. 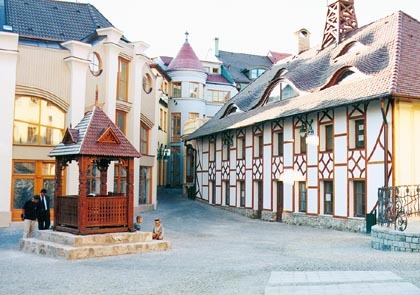 The idea of the reconstruction of the town at the main square of the free royal town Komárno is of the same age as the idea of building the Europe Place… Following from the aspect of „ genius loci“, from the aspect of the spirit of the place it can be only self-evident that the works of art important for the town, but lost in the storms of the history, are reborn slowly. Like for each good thing we have to fight our battle against the envy and ignorance of the people and sometimes we have to take on the open clash. The town can make significant steps ahead in the field of the material and spiritual restoration in realizing of this and similar ideas. However, the history of the well does not end here, as its definite fate after the expiry of the permission for its temporary location was not yet decided. We can only hope that the right-thinking wins and the well will stay on its worthy place, where it was placed in 1777. The building of the town theatre, which stands in the yard of the Zichy Palace, also belongs to the historical monuments. In the course of the construction works we have excavated the foundations of the building where the limestones from the Roman military camp in Leányvár near village Iža were used. The information untill now show that this building probably comes from the 17th century and was built near the medieval cementery and likely this was the original curia of the Zichy family. In the years from 1800 to 1827 the building was used by the theatre companies visiting the town for its performances and the balls took place there too. Not only the trade but also the social life was flourishing in the free royal town. 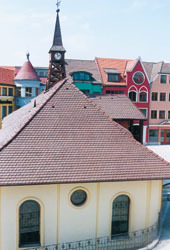 A German troupe from Bratislava visited the town many times at the end of the 18th century. The inhabitants of Komárno wanted to establish the permanent Hungarian troupe. The county supported the Hungarian theatre life at the beginning of the 19th century. The first stage was built in the main hall of the Zichy Palace in the centre of the town. The count John Zichy left the building to the performances. There were Hungarian and German troupes acting in this building. The greatest actress of that time, Róza Széppataki, the wife of Stephen Déry was acting and spent there a winter. An original wall-painting has been preserved from this era in the built up embrasures: on the green marble immitation yellow motive of the rose-window. The witness of the past (the reconstructed facade of the synagogue). The building was used as the theatre till 1827 when it became the property of the local jewish community and it was rebuilt for the first synagogue in the town (it was heightened, they built up a balcony for women, they made new windows and doors, and also walled up the theatre`s windows). The building was used later as a dwelling-house and subsequently it was reconstructed several many times. The last user was the Police of the town. The synagogue`s facade was reconstructed during the renovation works. The motive of colourful lead-glass windows are inspired by the wall-painting, which was partly preserved in the interior of the synagogue. We have found remainders of the Celtic pottery oven from the late La Téne period on 22nd of April 2000 during the grounding works of the Europe Place. It is possible to fix the age of the pottery oven on the basis of the rich finds (the black pottery and the colourfull glazed pottery) to the period around 60-50 B.C. We have found seven pottery ovens till now. This find of the Celtic pottery oven is unique not only in Slovakia but in the Carpathian basin, too. Ten different shapes and structures of the Celtic pottery ovens were discovered so far in the whole region along the Middle Danube (and also in Austria). This significant archaeological find shows that there was an important Celtic centre in the past on the territory of the present town and this is also evidenced by other archeological excavations in other parts of the town. The part of the pottery ovens will be exhibited in the Celtic Museum situated in the down square of the Europe Place within the framework of the Museum of Celtic Culture.